A phototube with one or more dynodes between its photocathode and the output electrode; the electron stream from the photocathode is reflected off each dynode in turn, with secondary emission adding electrons to the stream at each reflection. Also known as electron-multiplier phototube; photoelectric electron-multiplier tube; photomultiplier; photomultiplier tube. (also photomultiplier, photomultiplier tube), a vacuum-tube device in which an electron flux emitted by a photocathode upon exposure to optical radiation is amplified in a multiplier structure as a result of secondary electron emission. The electron flux emitted by an illuminated photo-cathode is called a photocurrent. The current in the circuit of the anode, which collects the secondary electrons, is substantially higher than the primary photocurrent, usually by a factor of 105or more. The multiplier phototube was first proposed and developed by L. A. Kubetskii between 1930 and 1934. The most widely used multiplier phototubes have a secondary-emission coefficient σ > 1. The electron flux is amplified by a system of individual dynodes, that is, individual U-shaped, box-type, or venetian-blind electrodes with a linear arrangement (see Figure 1) or, less often, a circular arrangement. To accelerate and focus electrons, the cathode chamber (which collects the electrons escaping from the photocathode into a beam and directs the beam to the input of the dynode system), the dynodes, and the anode are supplied with specific potentials relative to the photocathode by means of a high-voltage source, which has a voltage of 600–3,000 volts. 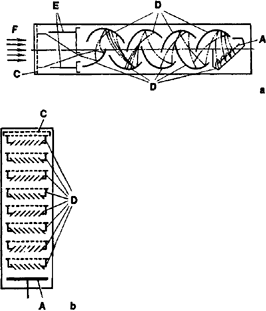 Electrostatic focusing, magnetic focusing, or focusing in crossed electric and magnetic fields is employed. Figure 1. Schematic diagrams of linear multiplier phototubes: (a) a multiplier phototube with U-shaped dynodes, (b) a multiplier phototube with venetian-blind dynodes; (F) luminous flux, (C) photocathode, (E) focusing electrodes of the cathode chamber, (D) dynodes, (A) anode. The broken lines represent the electron trajectories. Multiplier phototubes with the multiplier structure in the form of a continuous dynode—either single-channel or multiple-channel—are also used. A single-channel dynode has an active film (σ > 1) on its inner surface and a distributed electrical resistance; a multiple-channel dynode consists of microchannel plates. When a channel is connected to a high-voltage source, an electric field is generated in the channel. The field accelerates secondary electrons, which collide repeatedly with the inner walls of the channel. With each collision, secondary electron emission from the surface of the active film occurs. The photocathodes of multiplier phototubes are made from semiconductors based on compounds of elements from group I or group III of the periodic system and elements from group V. Such compounds include Cs3Sb and GaAs. Semitransparent photocathodes are usually deposited on the inner surface of the transparent window of a glass envelope. The materials used in the fabrication of individual dynodes include Cs3 Sb deposited as a film on a metallic substrate, the alloys CuBe and CuAlMg, and O2-treated epitaxial films of GaP on Mo. The channels of distributed dynodes are fabricated from glass with a high lead content; after heat treatment in H2, the channels have a surface-layer resistivity of 107–1010 ohm-meters. The main parameters of a multiplier phototube are the anode luminous sensitivity, the spectral response, and the dark current. The anode luminous sensitivity is the ratio of the photocurrent at the anode to the luminous flux that produces the current at the rated electrode potentials; it ranges from 1 to 104 amperes/ lumen. The spectral response of a multiplier phototube is equal to the spectral response of the photocathode multiplied by the multiplier structure’s gain, which usually ranges from 103 to 108. The dark current is the current in the anode circuit in the absence of a luminous flux and, as a rule, does not exceed 10–9–10–10 ampere. Multiplier phototubes are used mainly in nuclear physics (seeSCINTILLATION COUNTER) and in equipment for the study of short-term processes. They are also employed in optical devices, television equipment, and laser devices. In the 1960’s, a multiplier phototube was developed in which the photocurrent is amplified by bombarding a p-n junction semiconductor crystal with electrons that have sufficient energy to produce electron-hole pairs in the crystal. Such multiplier phototubes are called hybrids. Berkovskii, A. G., V. A. Gavanin, and I. N. Zaidel’. Vakuumnye fotoelektronnyepribory. Moscow, 1976.